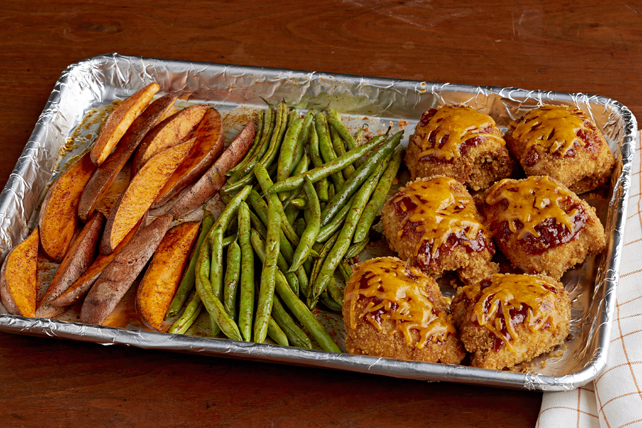 What's so great about our BBQ Chicken and Sweet Potato Sheet-Pan Dish? In addition to taking just minutes to prepare, this delicious chicken entrée is a cinch to clean up since everything is baked in the same pan. Line 15x10x1-inch pan with foil; spray with cooking spray. Coat chicken with coating mix as directed on package; place at one end of prepared pan. Mix oil and chili powder until blended. Add half the oil mixture to potatoes in medium bowl; mix lightly. Toss beans in separate bowl with remaining oil mixture. Place potatoes next to chicken, then place beans next to potatoes. Bake 25 min. or until chicken is done (165ºF). Brush chicken with 1/4 cup barbecue sauce; sprinkle with cheese. Bake 5 min. or until cheese is melted. Serve chicken with potatoes, beans and remaining barbecue sauce. Serve with a mixed green salad tossed with your favourite Kraft Dressing, and a glass of cold milk to round out the meal. A foil-lined pan not only prevents the food from sticking to the pan but it also helps make cleanup a breeze.